Buhler Farm King Y740 74"
Meteor SB97D Click here for details. No one knows for sure what type of a winter we'll have this year. But chances are slim that we'll enjoy a snow-free season. So if you're tired of fighting the wind-driven drifts, arm yourself with a smooth and powerful snowblower, blade or broom from Werner Implement. You'll be able to laugh at Ol' Man Winter from the comfort of your heated cab! 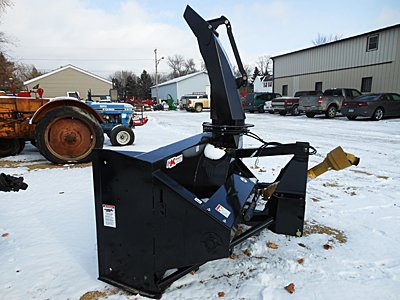 All Buhler Farm King Allied snowblowers feature "closed flighting" augers to increase the volume of snow moving toward the blower fan. That enables you to blow more snow than comparable models of this type. All models are equipped with adjustable, replaceable skid shoes, easily accessible chain tightener and offer shear-bolt protection. All are Quick Hitch compatible and all can be equipped with hydraulically operated chutes and deflectors. Simply match the model with your tractor size, from 15 horsepower to 180 horsepower. Then sit back, unzip your jacket and watch the snow disappear from your driveway and around your buildings. Our new Meteor snowblowers are brutes! The 3 pt. two-stage models are equipped with skid shoes and feature a heavy four-blade fan and high-tensile still ribbon flighting that chews through snow with ease and then blows it to where you want it. They also have hydraulic chute rotation. S.B. Select snowblowers are built to get the job done with durable performance and high-capacity design. 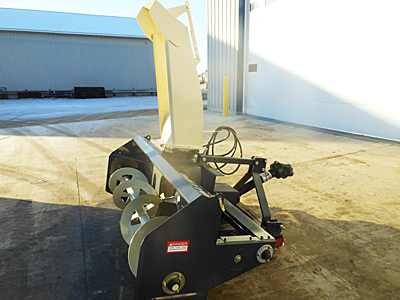 Chute rotators come in manual or with a bolt-on hydraulic option. Virnig manufactures tough, versatile blades for skid loaders. They range in size from 84" to 120" in width and are available in light duty or heavy duty models. Light duty models have single hydraulic cylinders controlling the blade angle. In heavy duty models, blade angle is controlled by two hydraulic cylinders. Heavy duty models also have four compression springs on the trip mechanism, while light duty models have two compression springs on the trip mechanism. 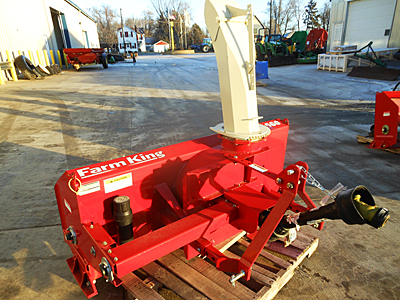 We also have two Erskine brooms in stock, one for a skid loader and one for a pickup. Both come complete with hydraulic hoses and quick couplers. If we don't have the model you want, give us a call and Mel, Randy or Charlie will try to find a blower, blade or broom that meets your needs. 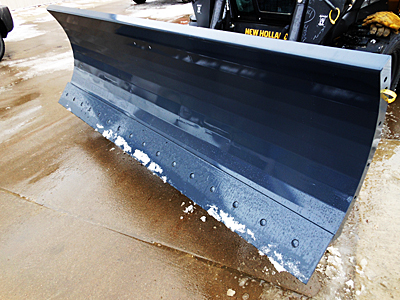 Click here to see our used snow removal equipment. 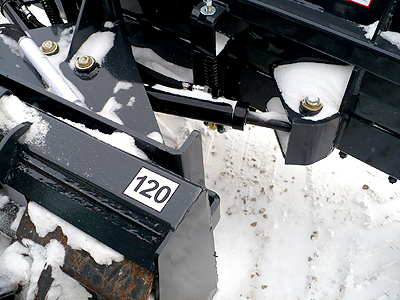 Virnig SWP108 108" snow pusher Click here for details. medium duty snow bucket Click here for details. standard snow bucket Click here for details. 8 a.m. - noon Saturday Werner Implement Inc.